Hello hello! Happy Sunday from NYC. Traveling this week and without my beloved Ninja blender…Trying to stick to my routine as best as possible…I’ve been drinking up smoothies and cold pressed juices all over the city! 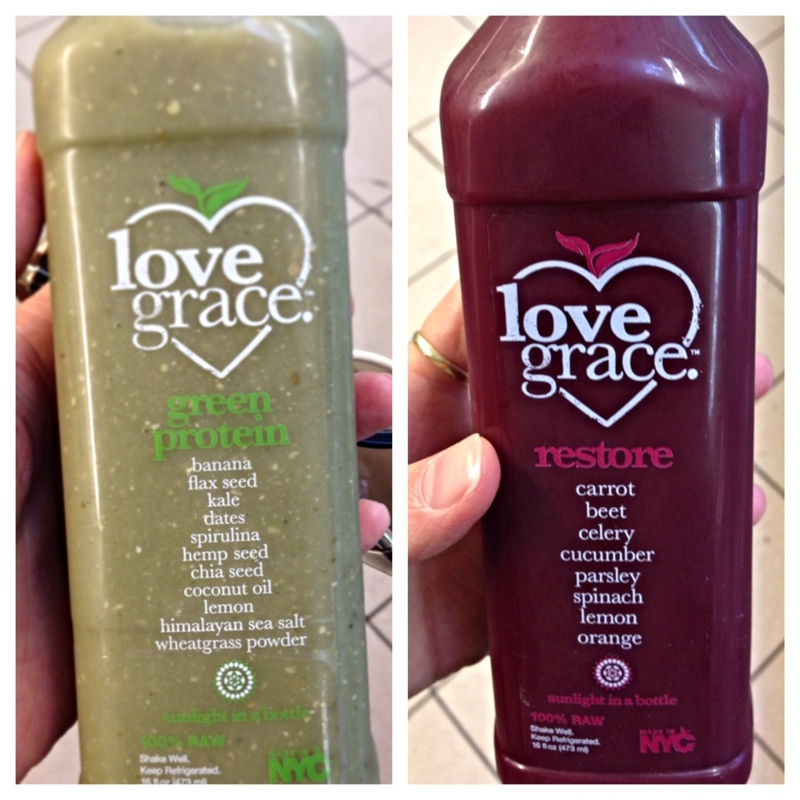 One of my favorite brands — love grace, has some amazing bottled juices & smoothies that I absolutely LOVE! Every time I’m in the city I love to walk over to Life Thyme Market, off 6th in West Village. This is the only place I’ve found that carries the love grace brand of smoothies/juices. Yesterday, I had their Green Protein and this morning…eh, technically this afternoon, I got in their Restore Juice – Yumm! Life Thyme is an organic, healthy, fresh food heaven! Beautiful, colorful produce, incredible variety of prepared salads and hot foods, juice bar if you feel like having one blended up especially for you, bottled juices, etc…u get the point! So if your into healthful, organic eating and living then I’m sure you’ll adore this place as much as I. Traveling this week reminds me of a few things…the ability to be flexible and adapt to your surroundings, planning ahead and most importantly just LET GO, enjoy life and live in the moment. I haven’t worked out since Tuesday and to be honest, it feels pretty damn good! It’s a good thing to give your body a break every now and then and I’ve enjoyed the change of pace these last several days. The gym, yoga and the whole routine will all be there waiting for me when I return home. It’s not everyday that I get to enjoy the amazing energy of NYC, so I decided to wander around the city, got in miles and miles of walking and enjoyed the incredible fall weather, rather than taking to being indoors to hit the gym or a yoga class. Although I love waking up and making my own green smoothies everyday, there are plenty of options available to please any juice or smoothie aficionado. Some of my favorite juice spots and brands around the city are love grace, (as mentioned above) The Juice Press and Organic Avenue. If you live in or just visiting NYC and looking to check out some new juice companies, I’m sure you’ll love all 3 of these! As far as planning ahead goes… For example, Wednesday and Thursday night, I was in a hotel so I made sure to pick up almond milk the night before to have for my coffee in the morning. Thursday night, I picked up a BluePrint Green Juice to drink along with my egg whites in the morning. Remember to bring any and all supplements that you take on a daily basis. Packing… I rarely check a bag which is so nice and makes travel a breeze. Plan out your outfits and bring shoes and clothing that are versatile and can easily be mixed and matched! I typically bring one or two pairs of heels (booties for f/w season) and some comfy boots and loafers that I can bop around in all day. About to hop on my flight back to CLT, catch you all soon! Will be doing a fun picture post from this week/weekends DC and NYC travels. Previous Post Checking in from NYC!